Catching our eye on the Harajuku street one afternoon with their outfits are Ryuta, Yokoand Yuki. 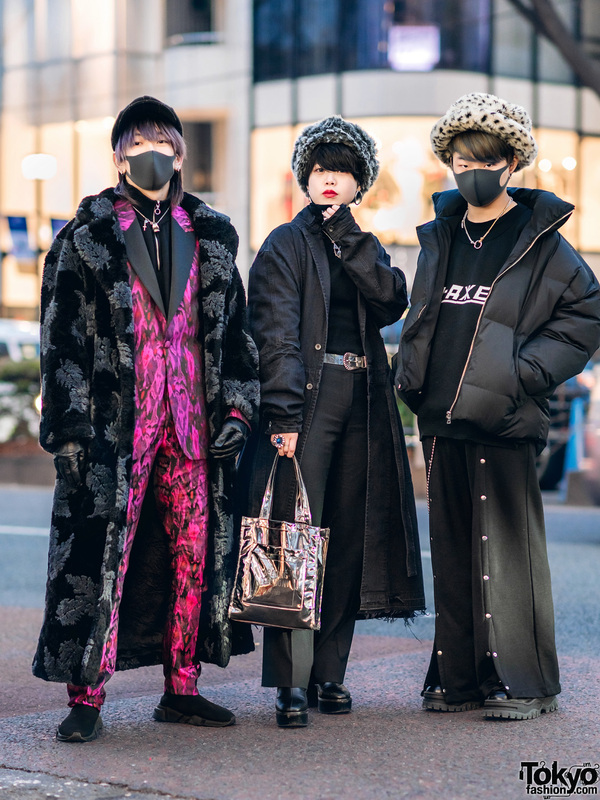 At the left sporting an interesting look and purple hair is Ryuta, a 20-year-old student. 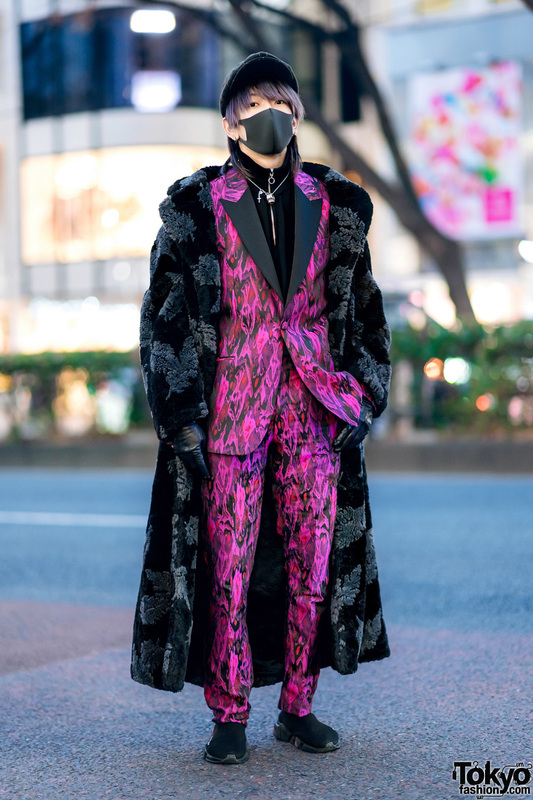 Ryuta is clad in a UK resale outfit, which consists of a black furry leaf print maxi coat, worn over a black zip-up top and a pink graphic print suit. 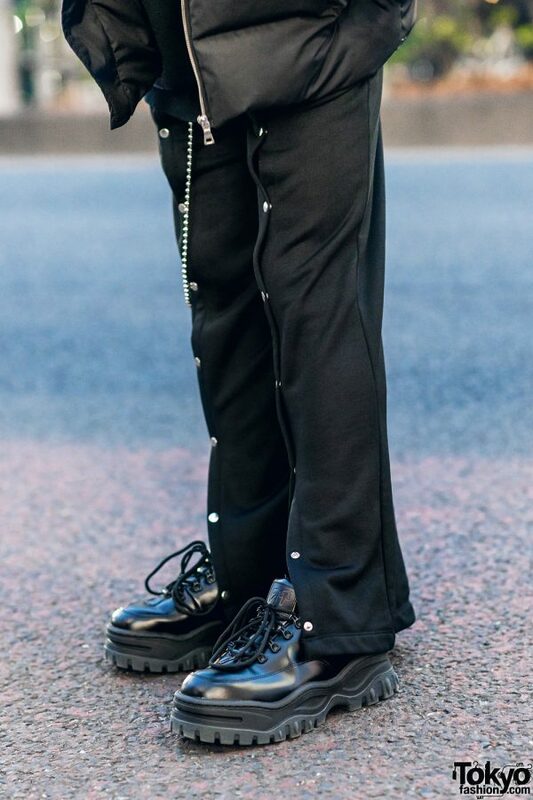 He styled his outfit with black Balenciaga sneakers, and accessorized his look with a black newsboy cap, a black mask, silver hoop earrings, a silver pendant necklace from Maison Margiela, and a pair of black leather gloves. 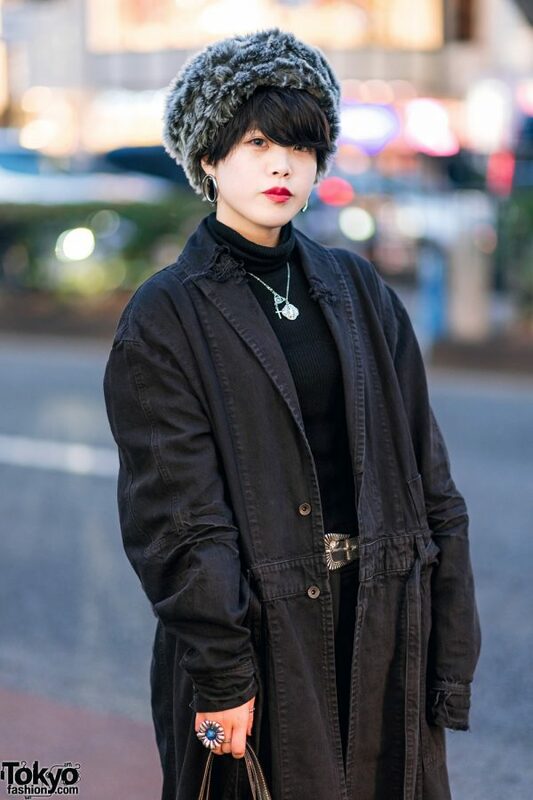 Ryuta loves to shop at Nuts Clothing, and he loves the music of Japanese hip hop and rap artist, Billy Laurent. 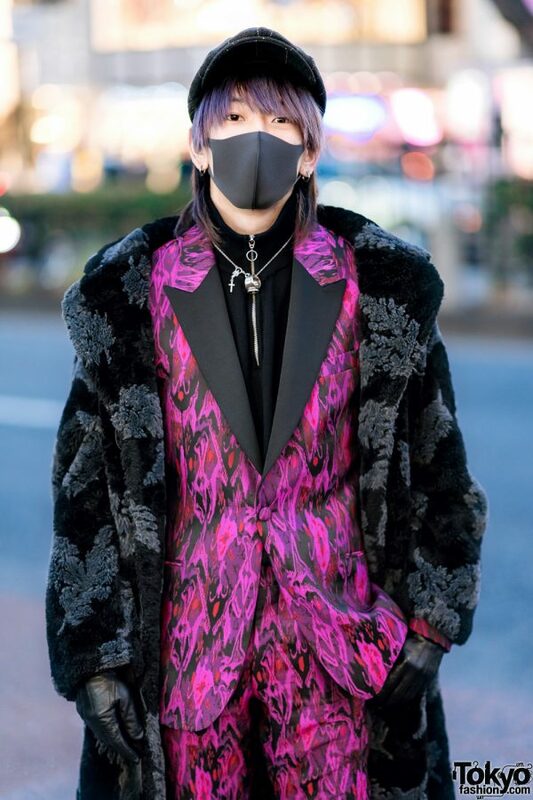 For more on him, follow Ryuta on Instagram. 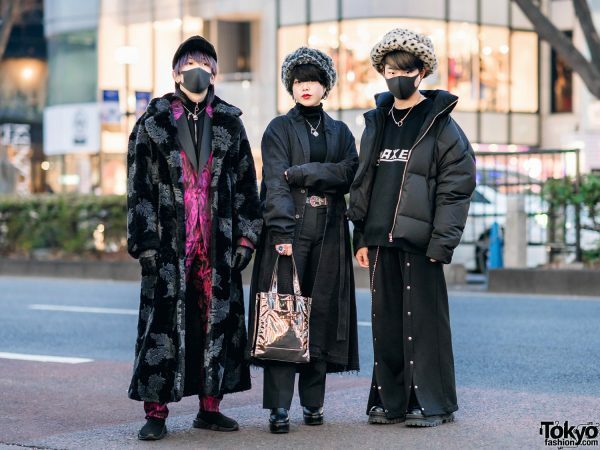 21-year-old Yoko – at the middle – is dressed in a black denim maxi coat from Julius 7, which she wore over a resale black turtleneck sweater. 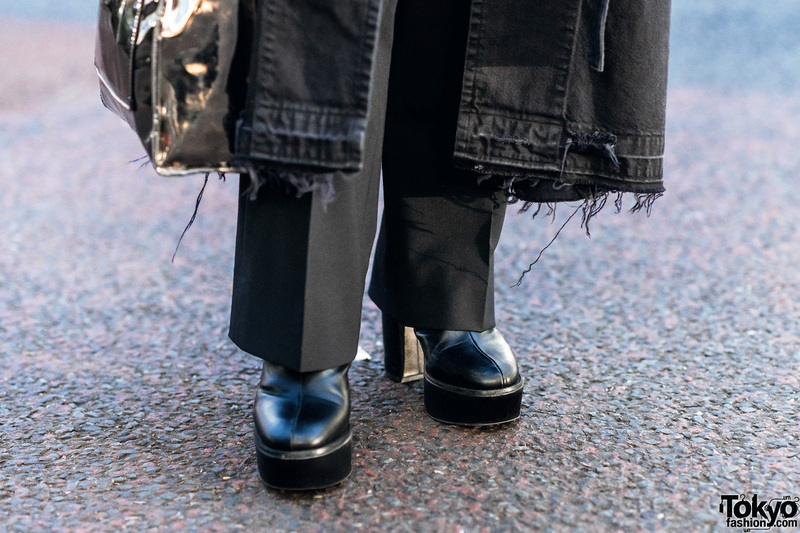 She tucked her sweater into resale high-waisted pants, and stepped into black heeled ankle boots from Murua. 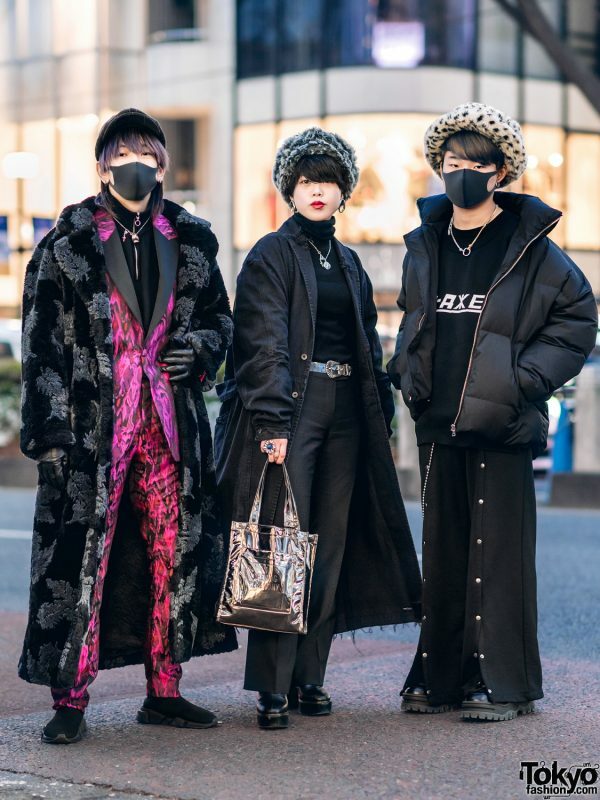 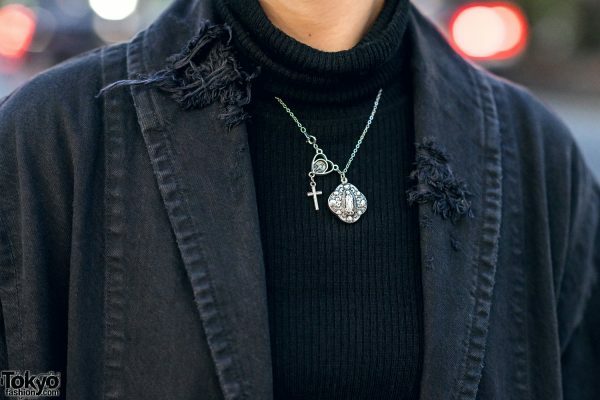 Her accessories – mostly from Beams – include a furry pillbox hat, silver hoop earrings, a silver pendant necklace, a silver belt, and a silver flower ring. 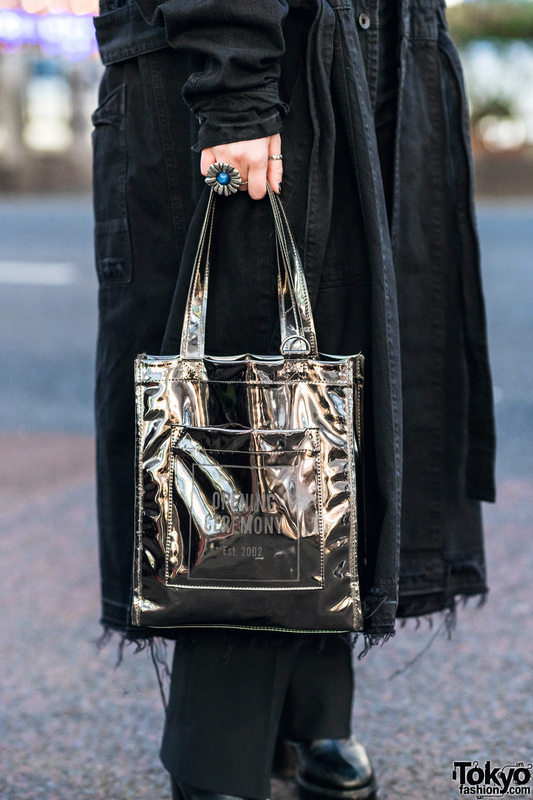 She finished off her look with a metallic tote bag from Opening Ceremony. 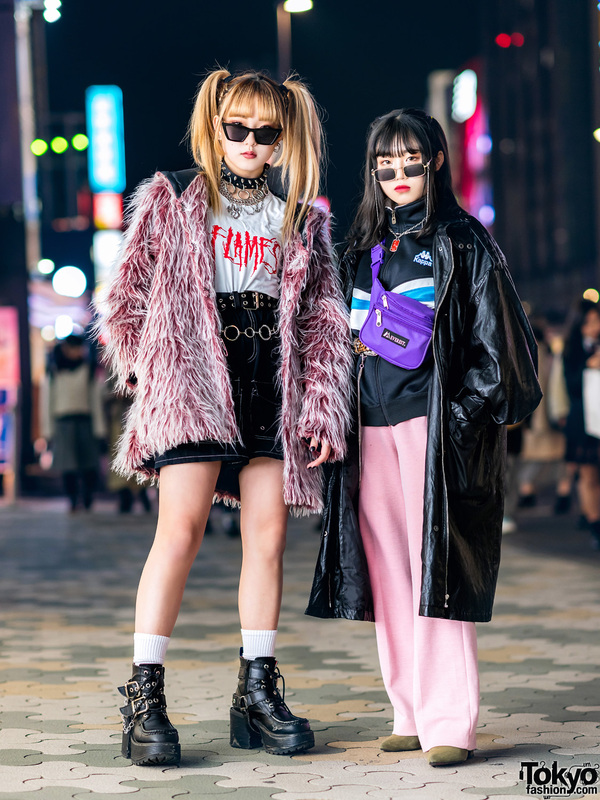 Yoko also likes the music of Billy Laurent, and she is active on Instagram. 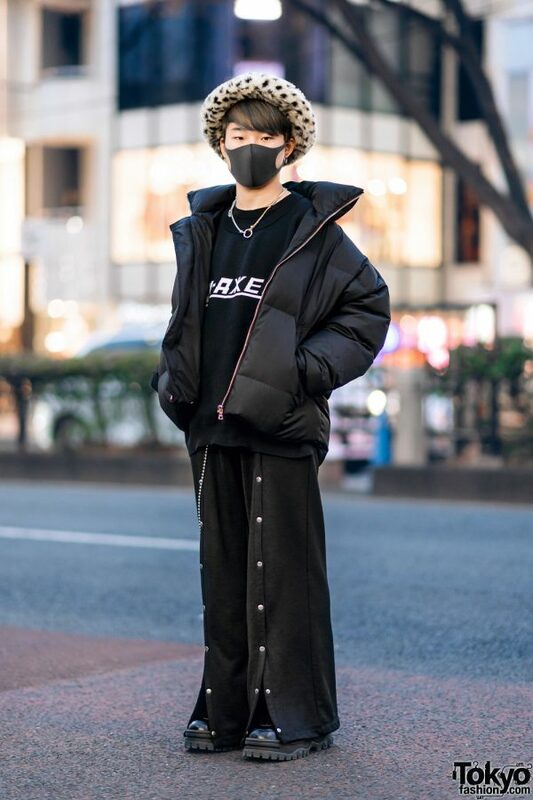 Meanwhile, Yuki stepped out in a resale / vintage black puffer jacket, a black sweater from Gosha Rubchinskiy layered over a black t-shirt, and black flared pants with button down cuffs detailing from Alexander Wang. 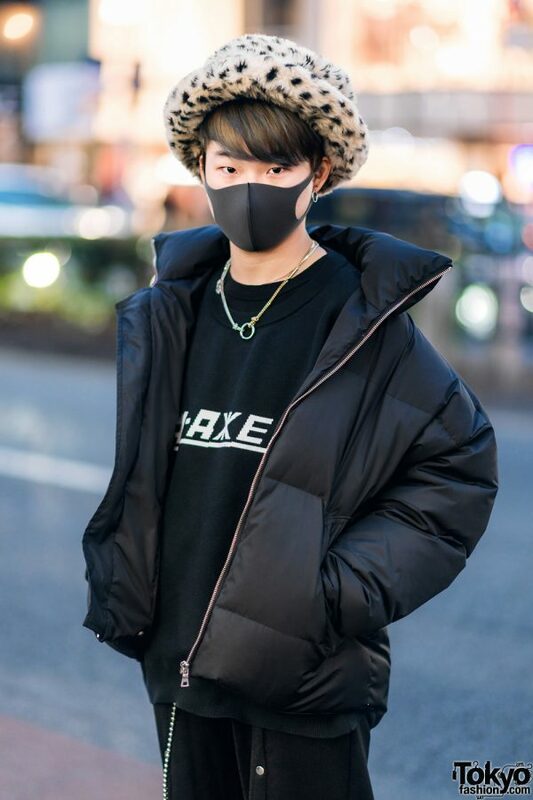 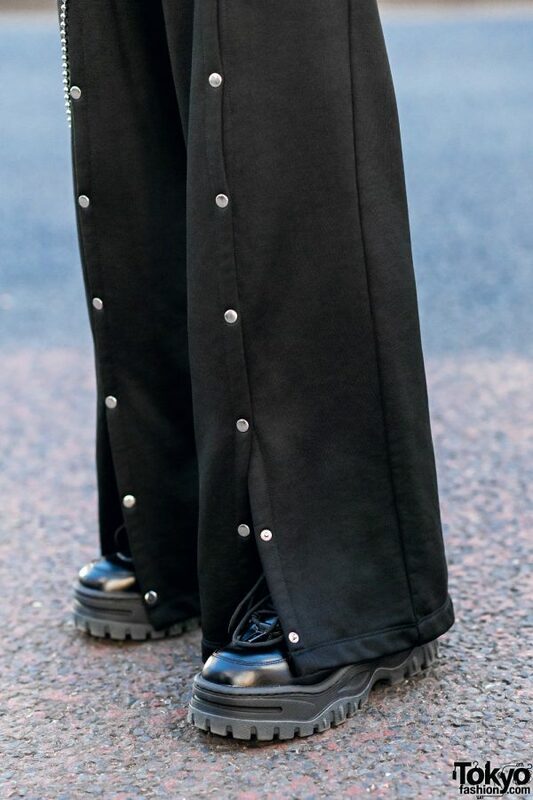 Black Eytys sneakers, and accessories – from Alexander Wang and MM11 – such as a furry hat, a black mask, silver hoop earrings, a silver necklace and silver chains rounded out his all black look. 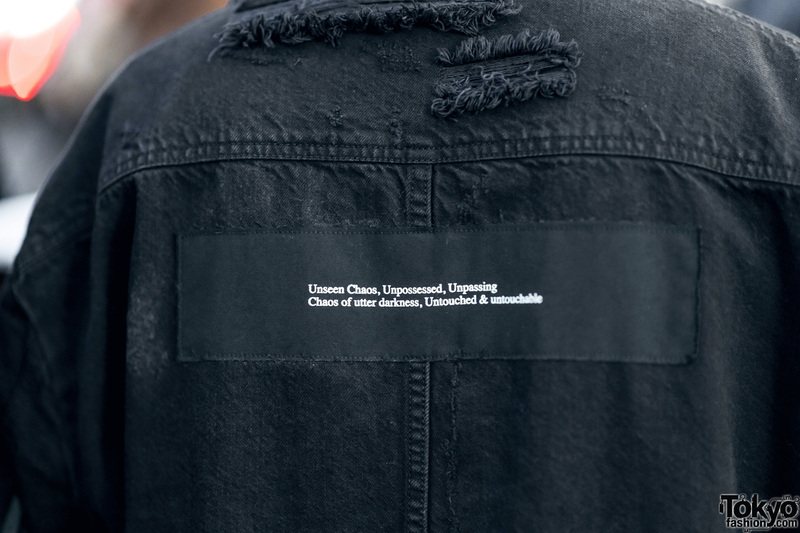 Yuki’s favorite fashion brand is Unfollow, and he loves listening to Billy Laurent. 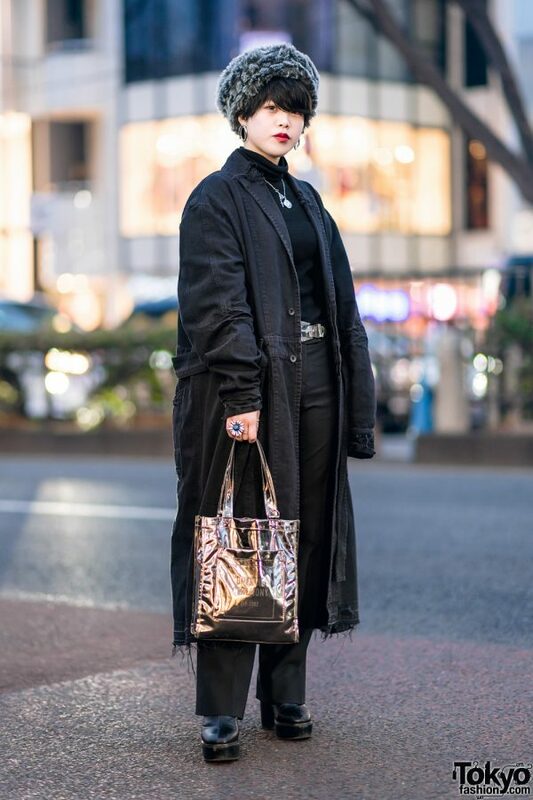 Ths 20-year-old student is also active on Instagram.